Note: Updates made on 7 April 2015 are shown in red font. There is a plethora of state census records now available online, something that wasn't in existence ten, even five, years ago! How are state censuses helpful in genealogy? They were often held in the years between the decennial federal censuses; many were enumerated in years ending in "5," such as 1885, 1895, etc. They are also a great substitute for the missing 1890 Federal Censuses. If your ancestor lived in a territory prior to statehood, chances are you'll find him or her enumerated several times, since territories often took multiple censuses in order to prove they had enough residents to be admitted to the Union. Finally, state censuses contain answers to questions that aren't normally asked in federal censuses: complete birth dates, specific birth locations, detailed information about your ancestor's farm (acreage owned, number of cattle, pounds of butter yielded in the past year, or bushels of wheat harvested). They often show lists of marriages by township in states that did not yet require keeping of vital records; names of churches and industries within the township, showing a larger picture of the community; and even details such as whether your ancestor served in the military or had a log or frame home! I decided to compile a list of state census records available at Ancestry and FamilySearch. Surprisingly enough, there is not a lot of duplication between them, which increases the amount of records available. FamilySearch records are available for free, but are offered in various forms: record images, indexed and searchable; record images, unindexed and therefore only browsable (lots of manual searching involved, especially if you're not sure in which county your ancestor lived); and no images, with the records' transcribed indexes available for searching. Ancestry records require a subscription, but many public libraries offer the Library Edition for free to its patrons. Ancestry often combines territorial censuses with state ones. On both websites, not every county is represented for each state census available for a multitude of reasons: records were lost or destroyed; the counties in question were not yet formed; or the website has not uploaded all available records for that census year. Also, not every state census year is available online yet. Michigan, for example, had a state census in 1884, but Ancestry only has the one for 1894. What you won't see here are colonial censuses, tax lists, or voter registrations, merely because that's a slippery slope into census substitutes. I have included only state or territorial censuses conducted by each state's (or territory's) official government, or--in the case of a few states in 1885-- the federal government. A few states, such as Iowa and Washington, also conducted some county censuses and I have mentioned these as well. The latter are also available in transcribed format only at the Washington State Digital Archives website for free. State Census Records by Ann S. Lainhart - a nice overview of each state's census and where to locate the records offline. 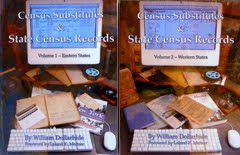 Censuses Substitutes and State Census Records by William B. Dollarhide - Volume I (Eastern States) and Volume II (Western States) - these volumes go into much greater detail than Ann Lainhart's book and list Family History Library microfilm numbers of many of the state census records and substitutes (tax records, voters lists, etc.). 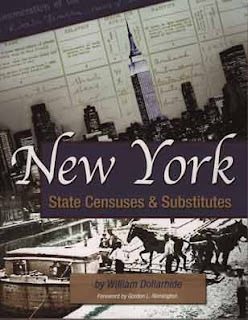 New York State Censuses and Substitutes by William B. Dollarhide - if you have New York State ancestors, you need this book! New York state census records are some of the most difficult to find, as they are not stored in one central repository, but in many town halls and court clerks' offices around the state. Even if you have Dollarhide's Censuses Substitutes and State Census Records Volume I (Eastern States), you will need this book because it is much more comprehensive than the latter, which only shows the state census information from one New York county. Disclaimer: I am an affiliate for Ancestry.com and Amazon.com. This blog post contains affiliate links. Thanks for the informative post! I'm proud to say that I was a keyer for the 1885 Nebraska State Census with the Ancestry World Archives Project. It was the first of several projects that I keyed, and it was tedious, but fun! I hope those of you with Nebraska ancestors strike gold and SMASH down some brick walls! Thanks for the work you did, Renate! My husband's great-grandmother and her parents appear in Madison County, Nebraska on this census! Thanks for this post; and thanks to Renate and the others that contributed to these records being available. I did a few very early ones, long ago. Yes, it is tedious, but it is Ohhhh so satisfying! Keep those ancestor stories coming! Wow! Nice work and great idea. Thank you! Thank you for dropping by and for your kind comments, Bill and Herstoryan! very nice summary article and it let me know some things that were new to me. The local-to-us genealogical society bought the library federal films with agricultural and demographic data; in NY at any rate the state census includes marriages and deaths occurring in the 12 months preceding the census. Since in NY there aren't official records until 1881, the 1855, 1865 and 1875 censuses are great sources for this information. One of our small internal projects is to key in the card index to Monroe County NY for 1855 with every bit of information on it, and make it searchable on the web (in an Excel spreadsheet). This would allow browsing and sorting in addition to what is available online already. The town historians are anxiously awaiting the completion of this. Wow, what a useful list you've compiled! Thanks very much for taking the time to figure out what's available and also to take it a step further and offer references for further research. I'm sure many of us will be saving and/or printing this blog post for future reference. Thanks again! The Carnivals Are in Town!